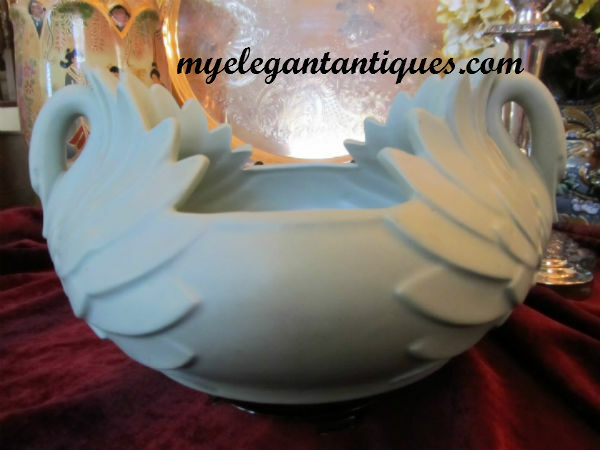 We are pleased to be offering this gorgeous double swan bowl, model #7126, made by Haeger Potteries in 1986. 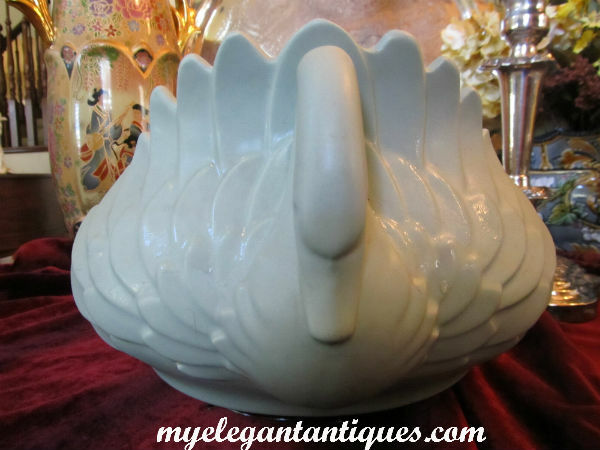 This fabulous Art Deco inspired piece has a soft matte sage green glaze and is in perfect condition, with no chips, cracks, crazing, staining or other signs of hard use. 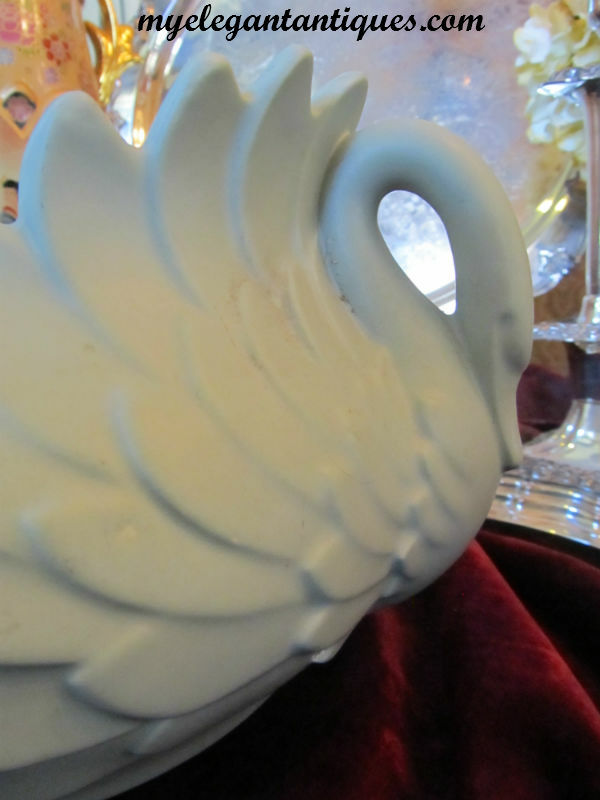 This is a big bowl resting on a 6-5/8" base, standing approximately 6" in height, and measuring approximately 10-3/4" from the top of the first swan's head to the top of the second swan's head. This bowl is breathtaking. 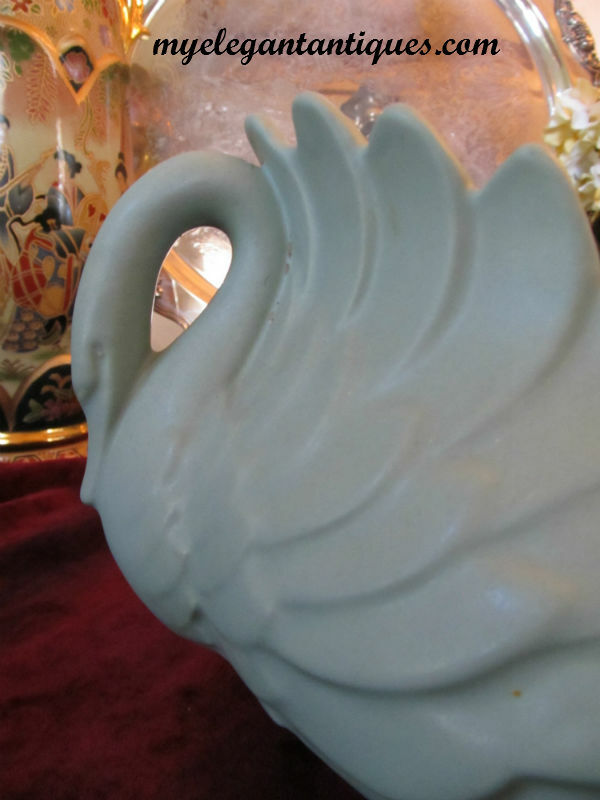 The curve of the swans' necks, the sweep of their plumage, and the simplicity of the glaze highlights the iconic nature of the design. 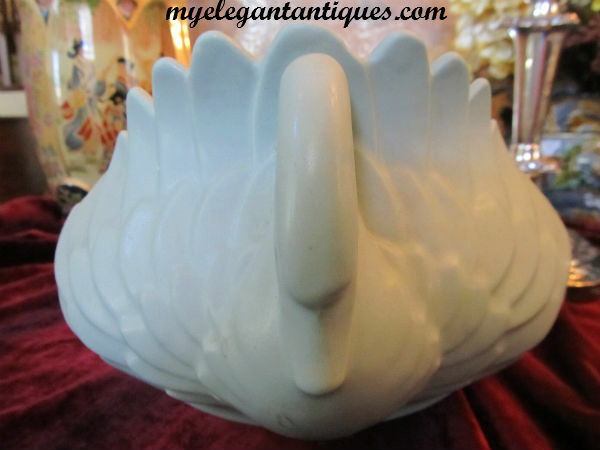 Our double swan bowl still has its original paper tag (see our photographs). 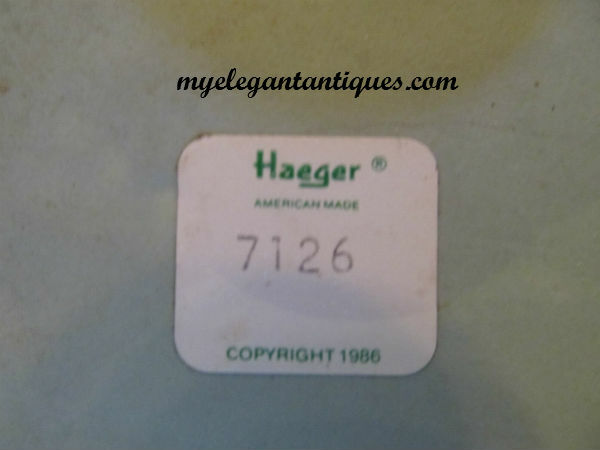 Many Haeger pieces were either unmarked or had paper labels that came detached or were removed, so it is quite exciting to find a piece with its original tag! BRIEF HISTORY: Haeger Pottery is not as well known as its competitors Hull or Red Wing, but its quality is undeniable. We find their history to be equally as interesting: David H. Haeger came to the United States from Germany and founded the Dundee Brickyard in 1871, making bricks and tile to rebuild Chicago after the great fire. Haeger had aspirations beyond the manufacture of bricks and was interested in branching out to the design and production of art pottery in the United States. In the last decades of the 19th century, the company began making small and simple earthenware pots for wholesale and retail sale. David Haeger died in 1900, but his son Edmund continued the pottery work and gained great sophistication in the production of designs and glazes. Edmund changed the name of the company to Haeger Potteries. Haeger's "Adam and Eve" line of pottery introduced in 1912 was the company's first art pottery collection. The line won critical acclaim for the richness of the colors and the quality and lustrous appearance of the glazes. In 1914 the well known artisan Martin Stangl came to work at Haeger Potteries, and further advanced their transition into a maker of fine art pottery. Stangl came to Haeger from the Fulper Pottery Company of New Jersey, which was known for their innovative forms and rich, flowing glazes. The contributions of Stangl to Haeger's success were probably incalculable, for many of the new Haeger glazes Stangle created were considered to be directly analogous to those he created while at Fulper. In 1919, Stangl went back to Fulper although Haeger continued to produce his designs and glazes. 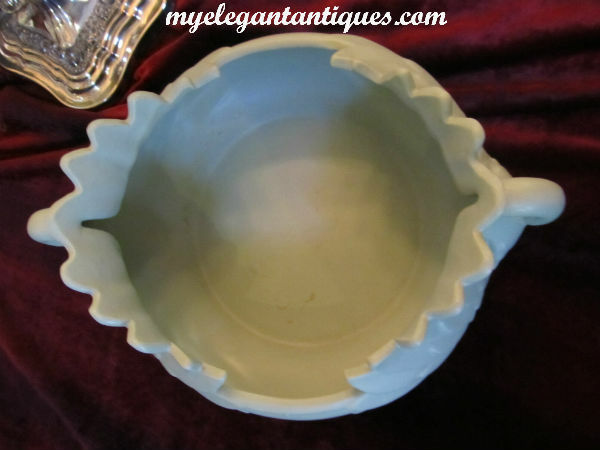 (Stangl acquired Fulper during the Depression years and renamed it Stangl Pottery). The Haeger family continued to be actively involved in the company's operations. Edmund Haeger's son-in-law Joseph Estes became the general manager of the factory in about 1938, and later president upon Edmund Haeger's death. It was during this time that the designer Royal Hickman came to Haeger to create the Royal Haeger line which continued until the Company closed in 2004. Hickman was born in Oregon in 1893 and worked as a designer for various California and European potteries before coming to Haeger. Hickman's design aesthetics were flowing and elegant. Art Deco and modern influences were evident in Hickman's Royal Haeger designs; both panther and swan themes frequently appeared in Haeger lamps and decorative pieces. Royal Hickman worked for Haeger until 1944, but continued to contribute additional designs to the firm during the 1950s on a freelance basis. Other designers of note worked for Haeger, including Eric Olsen, who created the Haeger bull, as well as Sascha Brastoff and Franz Joseph Koenig. Royal Haeger is best known for its animals, birds, and other figurines. The manifestations of these designs appeared in their lamps and lighting. Haeger's 1950's "TV lamps" have emerged as a major collecting item. In 2013 Haeger Potteries celebrated their 142nd year of innovation and fine craftsmanship produced in the U.S.A.